July 2008, Showing front of house looking south. July 2008, Showing side of house looking east. Additions: Originally started as a two family home, but was later (1954) developed into a multi-family dwelling at both addresses. 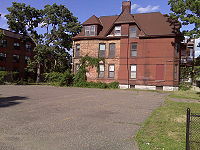 The land that this building is on is the site of the Elliot Park 2008 Archaeological Dig. 722-724 is the largest and most impressive structure of the lot and the only one still standing. 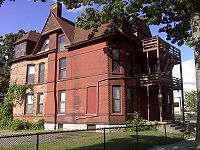 D. R. Wagner, a grain commissioner in Minneapolis, funded the addition to the city in which this house is built. On the 25th of May 1893, he received a permit to build a home outside of the Minneapolis fire limits. D. R. Wagner planed to build a two-story brick double family home by September of that year. Each of the two levels, as well as the basement, 2012 square feet. The total building cost was $5200 dollars. An extra $600 for the plumbing was spent not even a month after receiving his permit, when his home was updated with new plumbing installations, including WC’s, tubs, basins, and boilers. Electricity was added to the home 25 years later and took about another 10 years for the job to be completed. In 1927 a 19 x 28 x Œ8 foot garage was added. The 1950s brought a series of renovations. By 1954, a gas range, 4 WCs and two tubs and sinks were added to create a more apartment style complex. Alterations completed in 1960 for interior changes, cost almost as much as the original building price. In 1960 the Health Department ordered alterations (at a cost of $4800) "for the following authorized occupancy:" 1st floor - one dwelling unit and 2 TU, 2nd floor - 4 TU, 3rd floor - 4 TU. Along with these alterations there was work done with the gas ranges, gas pipes and sinks. In 1965, the structure got a new water heater. No more permits were granted until a 1980 reroofing to meet code. The final permit on record was a 1985 inspection in order to "legalize existing conditions"-- 2 dwelling unitis on the 1st floor, 4 S/B and 2 RUs on the second floor, and 4 S/B's on the third floor. The building changed hands a several times: By 1927 it was owned by John Wallen, then Walter Benjamin by 1954 and through at least 1960. From at least 1980 to 1985 it was owned by Errol Kantor, though a 1985 permit lists "Clara E. Benjamin" as taxpayer. Among the names that show up early in the building's history are the Reverend and Mrs. W. W. Dawley (722), Mr. and Mrs. G. C. Harper (724), and Mr. and Mrs. C. D. Wagner. View showing I-94/I-35W freeways in front of house. This page was last modified on August 31, 2015, at 16:17. This page has been accessed 21,689 times.